I surprised someone with my leet skills the other with this technique, so I thought I'd share it on the blog in case anyone else hadn't seen it - I use it ALL the time :) Chrome has a feature which allows you to copy a web request as a curl request, so you see all the various elements of the request on the command line. 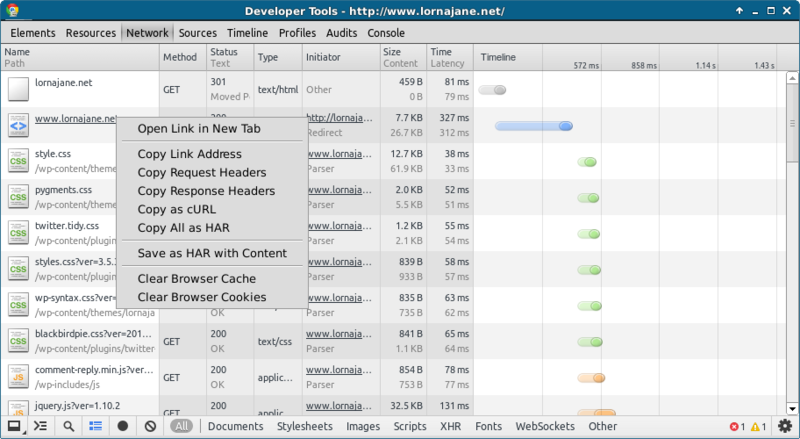 This entry was posted in tech and tagged chrome, curl, devtools by lornajane. Bookmark the permalink. I noticed this in firebug/firefox a few weeks ago too. Wasn't aware that Chrome already had it! Thanks, great tip. I will use it all the time too now. Awesome tips. Thanks for sharing that with us.